It’s built to last. Felled seams throughout the new spec Propper ACU Coat in 50/50 NYCO fabric enhance its durability, while a bi-swing back gives you improved range of motion. Hook and loop sleeve cuff closures provide an adjustable fit, while a three-pen pocket on the sleeve and minimized shoulder pockets add functionality. Wear the mandarin collar up or down. The ACU Coat is fade-, shrink- and wrinkle-resistant, stain- and liquid-repellent, and comes in a wide range of pattern options. 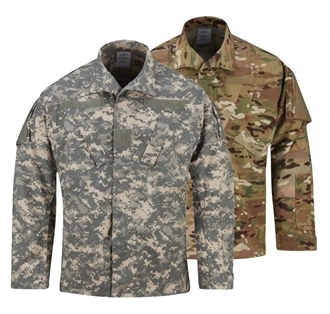 All pockets and pouches are consistent with military specification FQ/PD 14-04A. Approved for active duty use by the U.S. Army.